Continuing to look at the non-Marxian aspects of the Marx Bros’ films. 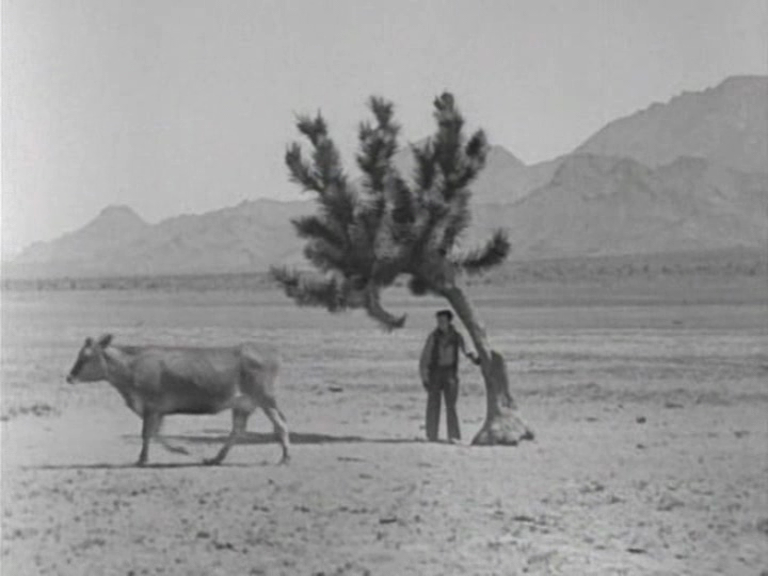 The Marx Brothers’ GO WEST is the one where Buster Keaton’s contributions as gag writer really make a difference — the train climax, which manages to be reminiscent of THE GENERAL without recycling any specific gags, is one of the best bits of Hollywood slapstick the 40s produced (see also the hyper-kinetic chases climaxing a couple of W.C. Fields movies, which make up in manic speed what they might lack in finesse). 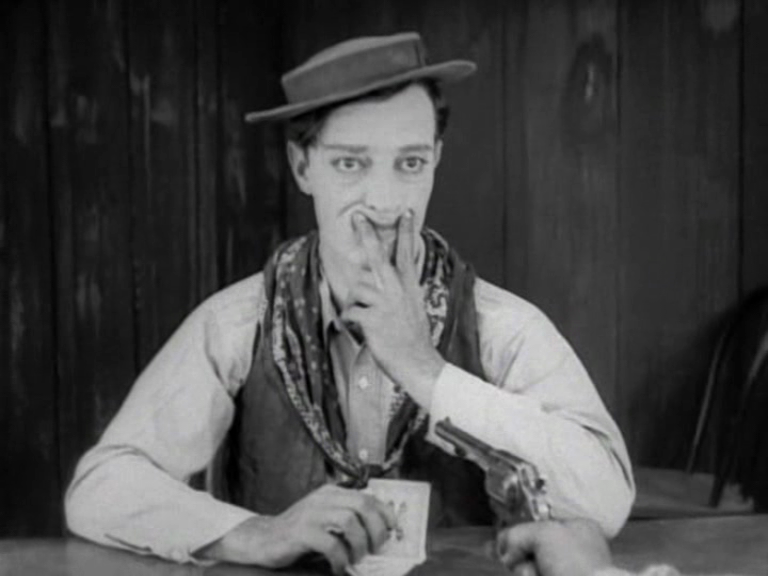 Buster may have played the brothers at high-stakes bridge, and collaborated successfully with them more than once, but he didn’t care for their casual attitude to movie-making. I guess this led to his otherwise inexplicable preference for Red Skelton, who evidently took his job seriously. A love scene occluded by horseflesh. It feels like an accident, left in the film whimsically, but I guess it’s a joke on censorship or privacy or something. If there were any real sexual chemistry imaginable behind the equine barrier, those readings would make sense. I like the gag, but I’m sort of glad there aren’t more like this. You don’t want the boring bits in Marx Bros films (the plot, the romantic interest, the musical numbers) to strive for zaniness. You would prefer they weren’t there. If they have to be there, you would like the girls to be charming, the songs to be tuneful, and nothing to go on too long. I don’t know what I would wish for the Allan Jones type leading men — a quick death, probably. Here we have John Carroll and Diana Lewis, who is perky. We also have a couple of bland villains, who do that grating angry thing when annoyed by the Bros, which makes them suitable targets. In DUCK SOUP, the only reason Edgar Kennedy is a worthy target for destruction is the grating way he says “WHAT’S THE IDEA FIGHTIN’ IN FRONT OF MY STAND AND DRIVIN’ MY CUSTOMERS AWAY?” He is actually quite justified, but his tone is so obnoxious he must be systematically dismantled. The Marxes don’t put up with anger. Even Groucho’s “So, you refuse to shake my hand?” is transparently trumped up, a pose, a parody of real outrage. Piano interlude — a natural for a saloon sequence. This starts out as the most promising Chico solo ever, with Harpo reacting in extreme excitement to the music, until he feels compelled to throttle a bar girl just to show how happy the melody makes him. Rose McGowan would not approve, but this may be the biggest laugh in a Marxian musical interlude ever, discounting the great Groucho comedy songs. Unfortunately, Harpo then calms down and we have to endure twice as much piano. Chico’s numbers are sort of amusing, but when you’ve seen one you’ve kind of seen them all. What else? Uncomfortable humour with Indians. This is a lengthy bit that doesn’t really contribute to the story, and also contains the inevitable harp interlude (using a loom as improvised harp). Buzzell gets desperate enough to track in a semi-circle around the offending instrument, the most elegant and imaginative move in the film. Makes me wonder how creative the average Hollywood hack would become if forced to shoot a whole movie full of tedium. Oh, there’s also an old-timer, the heroine’s grandfather or something, who must be placated so the plot can work out happily (which we don’t care about). This guy disappears from the movie almost completely, despite being the lynchpin of the whole narrative. He’s glimpsed at the happy ending, but more or less subliminally. 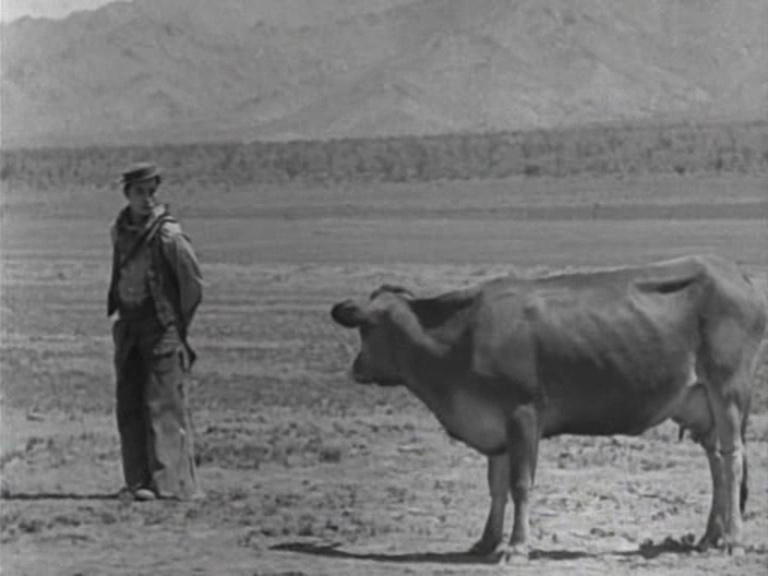 A shame, perhaps he could have become a kind of male, rustic Margaret Dumont. He’s meant to be a beloved curmudgeon, but he’s also standing in the path of love, so the Marxes new MGM role as anarchic cupids could have them assaulting his dignity. Actually Margaret Dumont playing the role, in overalls and stubble, would make EVERYTHING better. Lester’s debt to Keaton isn’t just a fondness for slapstick, or a tendency to use accelerated motion to evoke silent-film action (only in a few films, from 1964-1966). There’s a whole philosophy of composition. We could start with the famous dictum “comedy is long shot, tragedy is closeup,” and then add in the love of flatness, emphasizing the screen’s two-dimensional aspect rather than trying to transcend it. The simple, flat, graphic composition is easy for the eye to read, and clarity is the most crucial factor in visual comedy. It also stylises everything, removes it from reality (look at Wes Anderson’s similar love of the planimetric shot), making it easier to achieve comic distance. 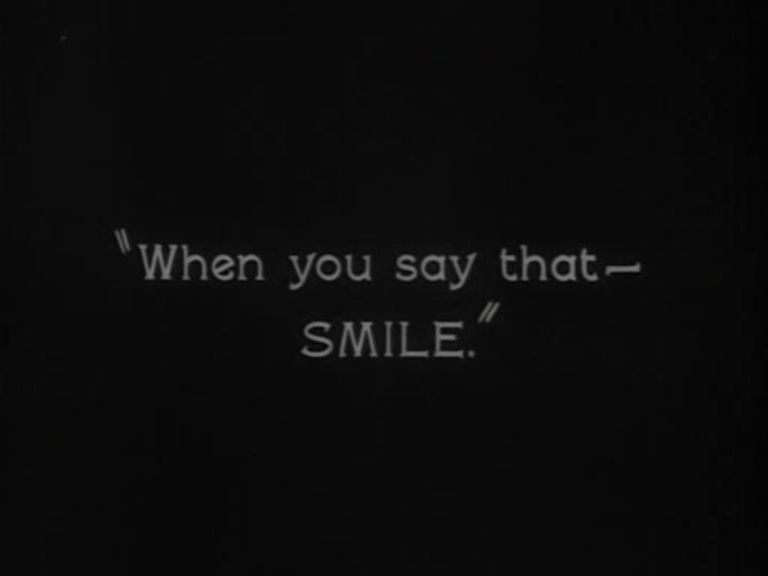 Lester credits Keaton with being the first to really use the space around the comedian as part of the joke. With Chaplin, he’s said, you always sense the proscenium arch (though Chaplin was certainly careful to get the right distance between subject and lens). With Keaton, somehow the shot itself is funny. 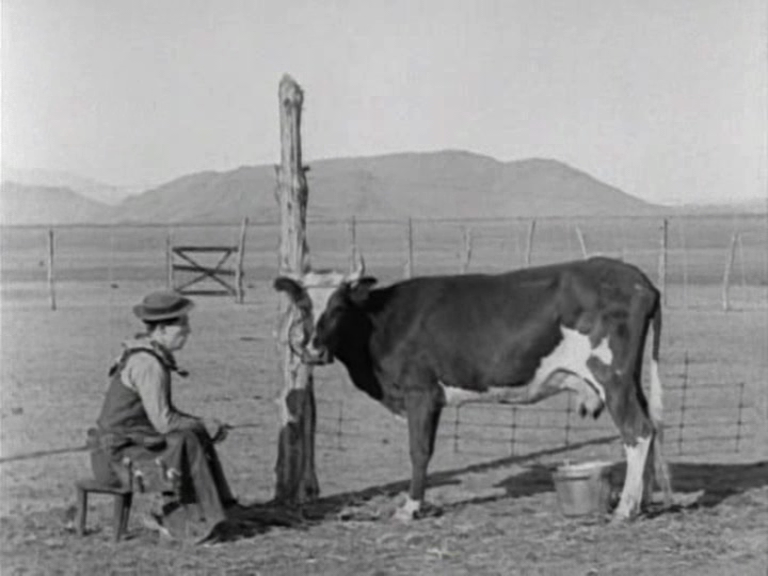 Lester has used the example of Keaton and the cow in GO WEST — extremely beautiful, and inherently funny just by the arrangement of objects in 2D space. I wasn’t exactly sure which shot he meant. But he could have meant all of them. You can tell this is a comedy, can’t you, just from the shapes?